A few months ago I was reading Fuzzygalore's blog when I saw a post about a Muffler Man she had found in California. "Fuzzygalore's blog entry"
It wasn't the first time she had mentioned Muffler Man and in another post she had mentioned Paul Bunyan. The guy looked familiar and it piqued my interest to find out more. I knew I had run into a Paul Bunyan on my cross country trip but had no idea what he represented. I wasn't born in the US but always had great interest in American history, it was time to find out, you can read more here: "Paul Bunyan Wiki"
After looking through my trip archive I found out I had run into Paul Bunyan and his animal companion, Babe the Blue Ox, in Trees of Mystery, a roadside attraction in Klamath, California. "Map location"
According to Wikipedia "the first figure was a Paul Bunyan character designed to hold his axe and then derivatives of that figure were widely used to hold full-sized car mufflers, tires, or other items promoting various roadside businesses"
Fuzzygalore had also mentioned there used to be one close to where I live near the Six Flags Great Adventure park in Jackson, New Jersey. 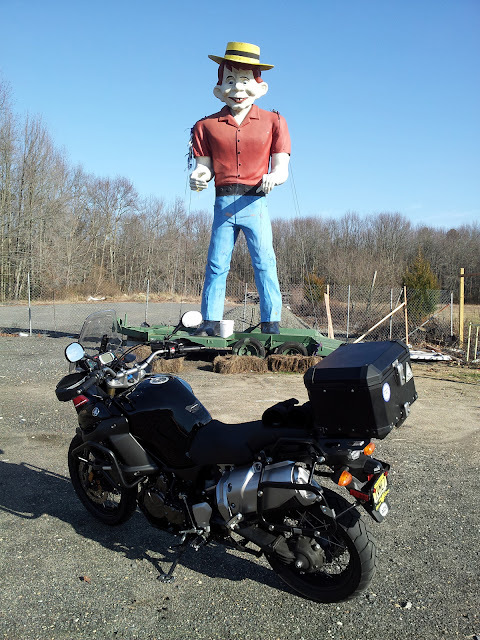 Well, it's Friday, a balmy 55 degrees, time for a road trip and find out if the "Muffler Man" is still there. Turns out he is there but no longer holds anything, I'm not even sure why he's there or what he advertised in the past. He is located a block away from the entrance to the Great Adventure park in a fenced in area all by himself. He is all alone but still showed a smile. Since the gate was open I rode my bike in and parked in front of the 20 foot Muffler Man just for perspective, the fella is pretty big. 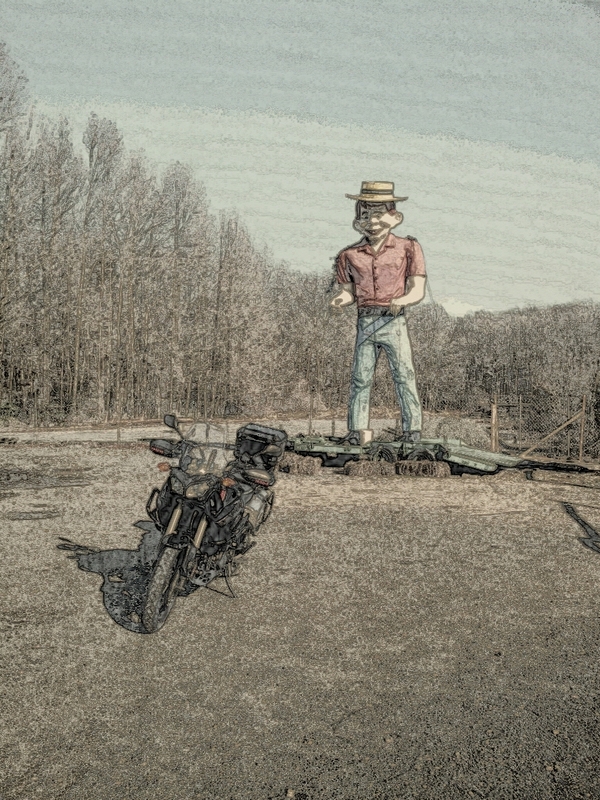 And then for fun I put him on my bike, he was looking at my bike with interest and that's the least I could do to help the lonely Muffler Man. I left the place and headed to my mom's home a few miles down the road for some coffee and cookies, she's always happy to see me and always has a bag of Milano cookies waiting for me, today she had the Mint Milano's, if you haven't tried them you should, they are super delicious. Here's an artistic view of the Muffler Man taken with my phone and created with "Camera360", a camera application for Android. George, I took nearly the same picture of Paul Bunyan in Klamath, CA is you did. Except the parking lot was full the day I passed it. I'll post a picture. "Trees of Mystery". Boy I haven't heard of that place since I was a kid (that was a long time ago). The artsy shot looks pretty cool. I like the artistic rendering. Very nice effect. Our Muffler Man isn't nearly as exciting. But it get the feeling looking at your Muffler Man that he appears more like the Mad magazine character. 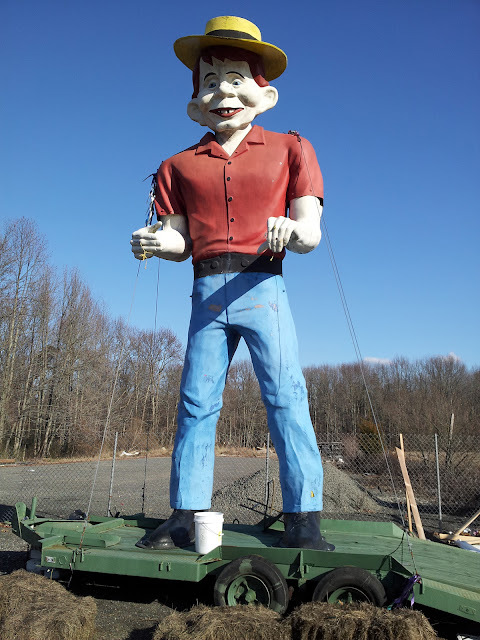 You are right and because of you and my friend Wayne I have created another post about Muffler Man and Alfred E. Neuman. Thanks. There is a muffler man near Shell Lake or Spooner, WI.It's standing outside a go cart track. 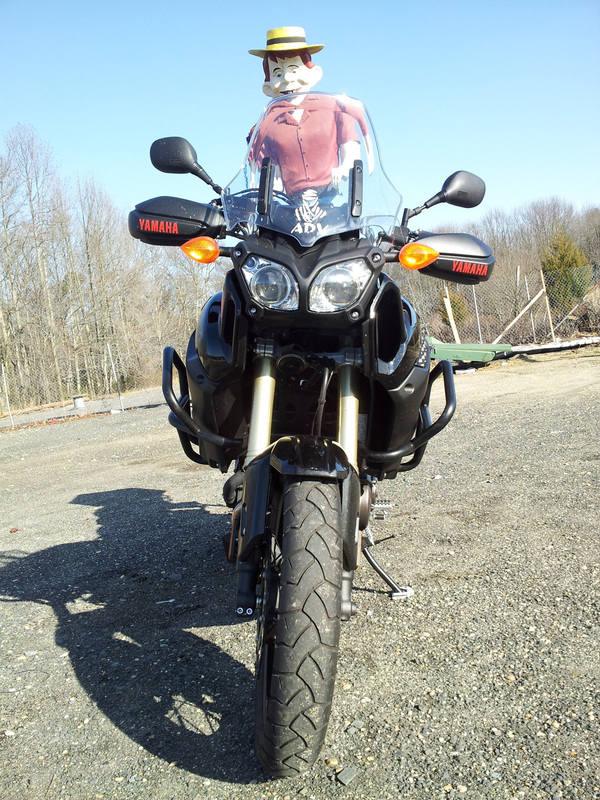 It's too late in the year for a motorcycle ride to it to get a picture, but I can snap one next time I go north. Our first motorcycle tour took us past ol' Paul and Babe. I vaguely remember the story from grade school. Having fun with the phone camera I see. It's a slippery slope once you start playing with those artistic filters. It can be addicting. George, I made a trip north. I added some muffler men photos.